Learn some helpful tips on how to make your resume really stand out amongst the pack. Don't Let Your Recume Slip Between The Cracks! These days you're competing with more people than ever, and a lot of those people are going to be a lot more qualified and experienced than you. The present economic climate has created an employment field absolutely saturated with prospective employees, both new to the market and seasoned veterans, and you need to do everything you can to stand out. Getting yourself a step or two ahead of the crowd starts with your resume, and there are a few points you can keep in mind when creating a resume that stands out. Design Matters. We like to think the only think which should matter when it comes to our resume is the document's content but this simply isn't the case. Creating a document which looks attractive and reads smoothly is as important as having plenty of work experience and transferable skills. 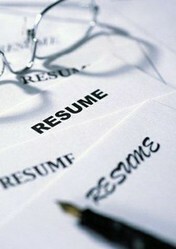 An attractively designed resume is going to read a lot better than a crowded, thoughtless resume. Employers have to quickly scan through many, many resumes for every position they need to fill and if yours doesn't stand out or is difficult to read than you're going to be tossed to the side even if you're a prime candidate. Large blocks of undifferentiated text will make a potential employer's eyes glaze over. Simplify your resume to include only the most important and relevant elements of your experience and then state these points as clearly and simply as possible. Use bullet points, numbered lists, bolded keywords and other simple design elements to make your resume easy to read and easy to like. Don't over-do it. Notice what I mentioned up there- "include only the most important and relevant elements of your resume." Earning your Eagle Scout merit badge when you were 16 is going to look good if you're applying to work with the Boy Scouts but it's not going to help much for any other organization you want to work with. Including a lot of irrelevant filler not only makes you look lacking in confidence but it also steals attention away from those elements of your resume which will actually matter to your potential employer. Remember that a resume exists entirely to get you an interview; it isn't your opportunity to lay absolutely everything out there on the line. Instead produce a very focused piece of work which will grab your potential employer's interest and make them want to know more. Make personal contact. Even the best designed and most efficient resume may get lost in a sea of other impressive applications if you don't make some sort of personal contact with your potential employer. Give them a call on the phone and speak with them for a minute and then let them know to be on the lookout for a resume printed on red paper (or whatever identifying design element your resume incorporates). Meet with them in person, if even for a brief minute, when you're dropping your resume off just to shake their hand and put a face behind your resume. Even a quick email to introduce yourself and let them know to expect your application is better than sending a completely unexpected, unsolicited resume. Making your resume stand out doesn't need to take a lot of time, and putting in a couple extra minutes of effort can really help you get you through this first difficult step in the job hunt. Get the latest coupons for textbook rentals for those of you still in school.